Innovative High Resolution Electro-Static printing of Multifunctional Materials. 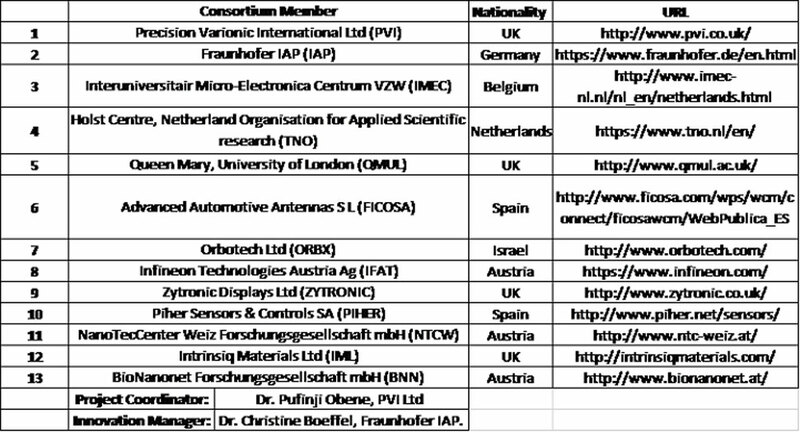 EU Funded Call: Nanotechnologies, Advanced Materials and Production (NMP-04-2014): High-definition printing of multifunctional materials: Project Start: March 2015. Project Duration: 42 months. At the heart of the search for the formulation of products for sustainability lies the integration of process and ingredient sources. To this end the nature of the source must be compatible with the manufacturing technology. In many process systems core to the broad concept of sustainability is the flexibility of additive manufacturing. The current paradigm seems to be that standard inkjet systems satisfy these objectives. However the operating parameter space of formulated products to meet inkjet requirements is still narrow, particularly in terms of viscosity and thus precludes many potential formulations that are close to the currently accepted market leading materials, particularly those that are used in high value products which include the integration of electronic components. Project HI-PROSPECT is geared towards developing a mid to high range production printing system (ESJET) to surpass any inkjet system in the printed electronic market place today. This patented electrostatic printer technology provides both higher resolution (feature size and print channel spacing) and a broader range of ink type compatibility than conventional ink jet technologies. ESJET is very novel and in contrast to current high resolution inkjet printers based on piezo operation, has no moving parts. It is as a result of this that very high print channel densities can be achieved since print channels can be arranged over a two dimensional surface, rather than being in a single print channel line. 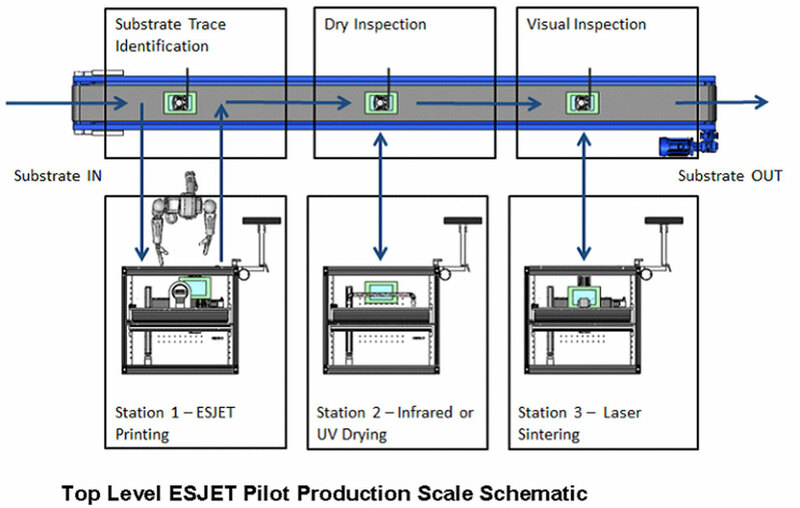 Thus typical channel spacing in commercial inkjet printers’ equipment is 50 to 360dpi whereas with the lab prototype ESJET printer, resolution of 2,116 dpi has been demonstrated with further research to achieve up to 10,000 dpi currently in development. HI-PROSPECT has already been proven at TRL 4 to print to a resolution of 1µm and be able to print inks with a viscosity of up to 40,000 cPs. The resultant printed/sintered structures will therefore be able to achieve a high resolution and increase final component properties through enabling the printing of highly filled nano-inks and functional organic materials. This technology will be further developed to TRL 6 within the project to allow for the design and assembly of a multi-head system that can achieve resolution, speeds and cost that far surpassed that of current ink-jet systems. The resultant system will be demonstrated at TRL 6 for a wide range of materials, including: nano-Cu and nano-ceramic filled inks and organic polymers. Each of these materials will be printed to create components specifically defined and specified by the industrial organisations within the consortium: Infineon, Ficosa, Piher (Meggitt) and Zytronic. The specific end-user defined applications are: Automotive aerials and sensors, metal meshed for OLED and touch screens, conductive through silicon vias and mechanical strengthening ribs for thin Si-wafers. These will be supported by PVI, IML, NTCW, ORBX, IAP, IMEC and TNO. The key enabling technology for the single and multi-nozzle head will be developed by PVI with strong support from QMUL and IAP. The printing platform and system integration will be developed by PVI, the sintering platform will be developed by ORBX. In addition, the safety and environmental friendliness of the high throughput HI-PROSPECT printing processes and the related products manufactured using this technology will be analysed through the activities of BNN, who will develop a deep insight into the material characterisation and testing results. See Link for project status.